The probability of survival for an organism is positively correlated with its ability to gather accurate information concerning its surroundings. Gathering inaccurate information will lead to improper or high risk behavior that could lead to the death of the organism. Within the aquatic environment, fish rely heavily on auditory, olfactory and visional cues. It is indubitably apparent that disruption of any of these sensory systems will ultimately decrease the probability of survival. 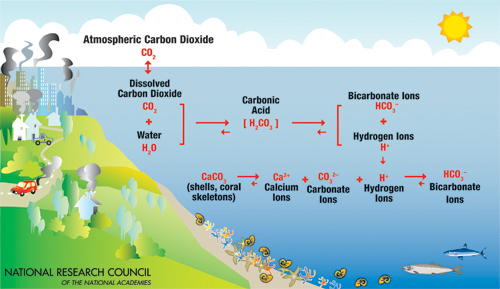 With the rapid addition of anthropogenic CO2 into the oceans, the decreased pH has been shown to alter such systems. A vital component in the auditory system of fish is the otolith. These calcium-based bony structures detect variations in compression waves and relay that information to the brain. As carbonate is added into the system via CO2, the otoliths’ growth rate is accelerated. Checkley and others reared white sea bass (Altractoscian nobilis) in solutions of 380 µatm, 993 µatm and 2558 µatm of CO2. Over the course of 8 days, the addition of CO2 stimulated growth in all three otoliths (sagitta, asteriscus and lapillus). The data showed an increase of size approximately 7% – 9% in the 993 µatm concentration and an increase of size approximately 15% – 17% in the 2558 µatm when compared to the 380 µatm control group. In 2013, Bignami and others found similar results in the cobia (Rachycentron canadum). Their data showed an increase in relative mass of the sagittal otoliths in cobia raised in higher CO2 levels. The alteration of both size and mass of the otoliths influences auditory. The increased mass and size allow the individual to discern lower frequency sounds and auditory cues from further distances. Bignami suggested the increase of background noise could be detrimental to many vital processes. Cues regarding habitat selection, predator evasion, navigation and basic kinesthesis will be masked, and recruitment, survivability and connectivity will suffer. Much research has been carried out regarding the role auditory cues play in the settlement of reef fishes’ planktonic larvae. Planktonic larvae typically avoid reefs during the day due to auditory cues of predators. However, when subjected to increased levels of CO2, planktonic larvae appear to disregard these cues and exhibit risky behavior around predators of the reef. With oceanic acidification advancing and promoting increased otolith growth, the sounds of a natal reef will most likely be lost to the increased noise of distant sources, and the settlement of planktonic larvae will dwindle. Once settled on the reef, fishes tend to rely more on visual cues for accurate information of the surroundings. Recent data from the work of Maud and others suggest elevated levels of CO2 will hinder visual acuity. Juvenile damselfish (Pomacentrus amboinensis) were acclimated to various CO2 levels and placed within sight of the predatory spiny chromis (Acanthochromis polyancanthus). Individuals acclimated at the elevated CO2 levels were shown to disregard the visual predatory cue, and increased foraging, activity and area usage were noted to be greater than the juveniles reared at lower CO2 levels. Their experiment was designed such that chemical stimuli from the chromis were not permitted to reach the juvenile damselfish, and as a result their data suggests the altered behavior was a result of CO2 impairing the visual system. In an environment of poor visual acuity, fish rely on chemosensory to assess their surroundings. CO2 levels have been shown to alter a prey’s ability to evade predators, which are known to remove up to 60% of new juveniles returning to a reef system. Any process altering a prey’s ability to survive will greatly hinder survivability and persistence of the species as well as their connectivity among habitats. Predators play a critical role in maintaining ecosystem health and structure through the reduction of prey abundances. Any process altering their ability to efficiently hunt will decrease the health and productivity of an ecosystem. Evidence from Cripps and others strongly supports this. While investigating how predicted future levels of CO2 would affect a predator’s ability to accurately identify prey items based on chemical cues, they found the brown dottyback (Pseudochromis fuscus) displayed a strong preference of prey olfactory cues in control levels of CO2, but when subjected to elevated levels, they displayed avoidance behaviors. Dottybacks from the control group spent approximately 60% of their time in the flume containing chemical prey cues. That value decreased to approximately 40% for the dottybacks in the elevated CO2 treatments. Further, predation rates can depend greatly on CO2 levels. At intermediate levels of CO2, predation rates increase without variation in preference of prey items. Ferrari noted the CO2 levels in which the experiment was carried out appeared to have no effect on the predators. Evidence showed the increased predation rate was related to the CO2 affecting the prey’s ability to accurately identify a threat and to appropriately respond. Further analysis demonstrated the varying predator avoidance behaviors displayed by prey when subjected to higher CO2 concentrations. The data confirmed their hypothesis by showing variation and intensity of response to predatory cues greatly depended on CO2 levels. Evidence such as this show, as CO2 levels rise, delicate predator-prey interactions will change and negative density-mediated effects will be motivated; it will ultimately result in various trophic cascades leading to permanent, negative ecological effects. Chemical cues have been shown to play vital roles in the ability of pelagic reef fish larvae to choose settlement sites and in accurate navigation to their natal. Similar to the assessment of predatory cues, alterations in these processes could be detrimental. Munday and others showed an increase of CO2 concentration disrupted the clown fish’s (Amphiprion percula) chemosensory ability to discern between appropriate and inappropriate habitat cues. Although the implications for this seem intuitive, Munday further suggests consequences for biodiversity maybe imminent. Navigational homing is directly affected by a decrease in pH, and cardinalfish (Cheilodipterus quinquelineatus), as well as other species, display impaired homing abilities when subjected to higher levels of CO2. Many species, like the cardinalfish, perform short migrations to exploit various regions for resources, and their survival relies on the ability to accurately return from such migrations. In addition to venturing further from their habitat, the rate of return to a home site by individuals from the CO2 treatment was approximately 20% lower than individuals from the control treatment. Although the mechanism in which CO2 affects these sensory abilities is still quite vague, recent data suggest promising remedies. The GABA-A receptor, the main inhibitory neurotransmitter, has a high affinity for HCO3–. The influx of the bicarbonate ion is theorized to reverse the GABA-A receptor function and disrupt the sensory abilities within fish. Data show a gabazine treatment will reverse the effects of individuals subjected to elevated CO2 levels; these promising short term treatments could temporarily offset the climbing CO2 levels. Without future research, the ramifications associated with the gathering of inaccurate information through disrupted sensory abilities are of critical concern for the future conservation of all species. Oceanic warming has forced changes in the hydrological cycle, which are to some extent manifested within the salinity regimes of the planet’s oceans. These changes have altered the stratification of isopycnals, and as a result, oceanic circulation patterns are changing. In the subtropical latitudes, accelerated evaporation due to warmer temperatures is causing an increase of salinity; in the northern latitudes, the increased temperatures are melting ice sheets, glaciers and polar ice caps causing an influx of freshwater into marine environments and ultimately decreasing salinities. Salinity is a major abiotic parameter when considering fish growth and reproduction, and it could be detrimental to marine fisheries when considering the observed haline fluctuations. The genre of salinity effects on growth rates are well documented within the scientific literature. Haline conditions are very similar in nature to thermal optima in that there is a specific range that optimizes biochemical processes. For example, the summer flounder (Paralichthys dentate) and the Southern flounder (Paralichthys lethostigma) show the greatest growth rates and development in intermediate salinities within the 8-14 psu (practical salinity units) and 5-30 psu ranges, respectively. In addition to growth rates, embryonic development within these two species is greatly dependent upon haline conditions. In 1994, Y. Lambert, as well as others, found similar results within the gadidae (cod) and scophthalmidae (turbot) families. The Atlantic cod (Gadus morhua) and turbot (Scophthalmus maximus) also show significant growth rates at intermediate salinities. These preferences for intermediate salinities appear to be common among many marine fishes. 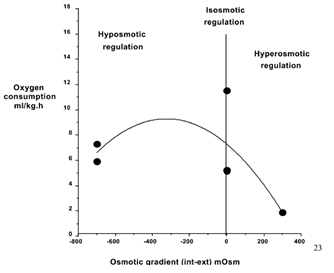 One hypothesis lies within the reduction of osmotic stress. When in a resting metabolic state, tuna have been shown to devote as much as 54% to 68% of available energy for ion regulation. Species of lesser metabolic rates will allocate approximately 20% to > 50% of energy to ion regulation. Salinities experienced outside these intermediate ranges could further lead to poor food and nutrient absorption, which ultimately leads to decreased somatic growth. Reducing the surrounding water to an isotonic solution will diminish the metabolic demands to maintain optimal internal osmotic gradients. This can be attributed to the decreased energy required to maintain Cl–, K+, Na+ and ATPase gradients across transporter proteins in chloride cells found in the epithelial lining of gill lamellae. The isotonic hypothesis could be the main cause of the increased growth trends in the intermediate salinity examples mentioned above. Support of this can also be seen in the work done by W. O. Watanabe and others in 1988. By subjecting red tilapia (Tilapia rendalli) to various salinity regimes, they were able to show an optimal salinity for food intake and growth. Due to the decreased osmoregulatory energy demands, the observed growth was attributed to the excess energy available to convert food items into somatic growth. Salinity has been observed to have this same effect on developing embryos. All species are able to acclimate within some range of haline conditions. Saline intensity has an indirect effect on the central nervous system by affecting hormones associated with the osmosensitivity in prolactin cells and chemoreceptors in the pseudobranch. In marine fishes, actively drinking saltwater is a strategy to replenish water reserves lost to diffusion, and the mechanism triggering this behavior can be linked to the activation of various dual purpose hormones such as the ones listed in the table above. For example, GH (a simple growth hormone) regulates growth while also aiding in osmotic regulation. In 2001, G. Boeuf and P. Payan hypothesized the water content in the stomach would trigger hormones such as GH, and the energy typically allocated to convert food to growth would then be allocated to osmoregulation (active drinking), resulting in decreased growth. Although no data currently show a distinct relationship between the active drinking behavior and hormonal growth control, the logic cannot simply be dismissed. The involvement of GH in both processes warrants consideration that both phenomenon are in some way linked and can be altered by fluctuating salinity regimes. Held, I.M. and Soden, B.J. 2006. Robust Responses of the hydrological cycle to global warming. Journal of Climate 19:5686-5699. Solomon, S., Qin, D., Manning, M., Chen, Z., Marquis, M. et al. 2007. Climate change 2007: The physical science basis: Contributions of working group 1 to the fourth assessment report of the intergovernmental panel on climate change. New York: Cambridge University Press. Durack, P.J. and Wuffels S.E. 2010. Fifty-year trends in global ocean salinities and their relationship to broad-scale warming. Journal of Climate 23:4342-4362. Antonov, J.I., Levitus, S., and Boyer, T.P. 2002. Steric sea level variations during 1957-1994: importance of salinity. Journal of Geophysical Resources 107:8013. Boyer, T.P., Levitus, S., Antonov, J., Locarnini, R., and Garcia, H. 2005. Linear trends in salinity for the world ocean, 1955-1998. Geophysical Research Letter. 32. Smith,T.I.J., Denson, M.R., Heyward, L.D., Jenkins, W.E., and Carter, L.M. 1999. Salinity effects on early life stages of southern flounder Paralichthys lethostigma. Journal of World Aquaculture Society 30:236-244. Specker, J.L., Schhreiber, A.M., McArdle, M.E., Poholek, A., Henderson, J., and Bengtson, D.A. 1999. Metamorphosis in summer flounder: effects of acclimation to low and high salinities. Aquaculture 176:145-154. Lambert, Y., Dutil, J.D., and Munro, J. 1994. Effect of intermediate and low salinity conditions on growth rate and food conversion of Atlantic cod (Gadus morhua). Canadian Journal of Fish Aquatic Science 51:1569-1576. Gaumet, F., Boeuf, G., Severe, A., Le Roux, A., and Mayer-Gostan, N. 1995. Effects of salinity on the ionic balance and growth of juvenile turbot. Journal of Fish Biology 47:865-876. Dutil, J.D., Lambert, Y., and Boucher, E. 1997. Does higher growth rate in Atlantic cod (Gadus morhua) at low salinity result from lower standard metabolic rate or increased protein digestibility?. Canadian Journal Fish Aquaculture Science 54:99-103. Imsland, A.K., Foss, A., and Gunnarsson, S. 2001. The interaction of temperature and salinity on growth and food conversion in juvenile turbot (Scophthalmus maximus). Aquaculture 198:353-367. Bushnell, P.G. and Brill, R.W. 1992. Oxygen transport and cardiovascular responses in skipjack tuna (Katsuwonus pelamis) and yellowfin tuna (Thunnus albacores) exposed to acute hypoxia. Journal of Comparative Physiology 162:131-143. Toepfer, C. and Barton, M. 1992. Influence of salinity on the rates of oxygen consumption in two species of freshwater fishes, Phoxinus erythrogaster (family Cyprinidae) and Fundulus catenatus (family Fundulidae). Hydrobiologia 242:149-154. Watanabe, W.O., Ellingson, L.J., Wicklund, R.I., and Olla, B.L. 1988. The effect of salinity on growth, food consumption, and conversion in juvenile, monosex male Florida red tilapia. In: Pulin, R.S.V., Bhukaswan, T., Tonguthai, K., Maclean, J.L. (Eds). The second International Symposium on Tilapia in Aquaculture, ICLARM Conference Proceedings A5. Department of Fisheries, Bangkok, Thailand and International Center for Living Aquatic Resources Management, Philippines, pp. 515-523. Boeuf, G. and Payan, P. 2001. How should salinity influence fish growth?. Comparative Biochemistry and Physiology 130:411-423.